An important link in the process "logistics" and "warehousing" is ...... transportation. "Hogenes Warehousing" has a fully equipped fleet of vans and trucks, trailers and furniture containers. Also hanging garment transportation by means of a specific car interior is an indispensable service provided by "Hogenes Warehousing". "Piece of mind" when you know that transport of your valuable goods are in the right hands. "Hogenes Warehousing" does not only provide the proper transport of goods to your customers, but also from the factory to the store, whether it is regional, national or international. Transport of sea-freights are also a possibility. In consultation with our client we can look after all the necessary documents for this service. Our World Web Warehousing team also works with other various carriers for small volume parcels. We have arrangements with TNT, Post NL, DPD, DHL and UPS so that our services are guaranteed. For international transport, import / export via airfreight, sea freight or sea-air services, we are working closely together with our partner ASIAN TRANSPORT & LOGISTICS BV. This is a freight forwarder specialized in transport from / to Asia, but has established worldwide coverage with exclusive partners. 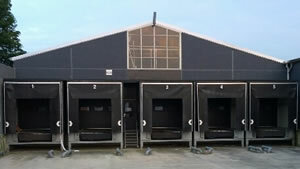 ASIAN has its own warehouse in Hoofddorp, Schiphol District, covering around a 1000 square meters. This warehouse mainly serves the purpose of pure expedition services with short-term stay of cargo, before it is delivered by Hogenes Warehousing at the airline or at a client's address. Hogenes and ASIAN integrated modern expedition software to be able to offer streamlined logistical services. This is, a complete logistical package with several benefits for our clients.